Adding Users – whether it’s to groups, announcements, custom people picker fields in custom lists, workflow or alerts. Either use the Browse icon (right) to get to the list of users, or type in their email addresses or AD numbers and authenticate them with the Check Names icon (left). TIP : typing in the name and then typing CTRL-K authenticates the name for you too. 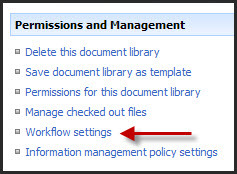 List / Library Settings – every item you create will have a Settings option with almost identical options for managing that library or list, (some extra features on document libraries). Document / List Item Settings – every item in a list and every document has a dropdown menu to manage it with. Alert Me – you can subscribe to changes and let SharePoint bring that information to you. Anywhere you see an Actions button, you will have Alert’s at the bottom. The Alert Me option is available at the bottom of the item dropdown menu, (as seen above). Rich Text Editor – format text, add images, links and tables all in the same way anywhere you see the rich text editor like announcements, calendar items, wikis, blogs and content editor web part. Attach File | Spelling – in announcements, calendar items, custom lists, team discussions, links, project tasks. Date Picker – in announcements, calendar items, tasks, project tasks. Creating Columns and Views – using metadata to replace subfolders is based on columns and views. This works the same in custom lists, calendars, discussion threads, document libraries, project tasks. Recycle Bin – restore documents, lists items and libraries by selecting the item and clicking Restore Selelction. Remember that restored document libraries and lists don’t automatically relink to the quick launch, you have to do that too. Workflow – setting up workflow is also uniform. Either do so from the document / list library settings, or from the document itself on the dropdown (see screen dump above). Creating Items – View All Site Content / Create and Site Actions / Create take you to the same screen. You might want to get used to using the Site Actions button instead though as that’s how it works in SharePoint 2010. Change the Name and Description of a List or Library, and Link / Unlink it from the Quick Launch – in the Settings of the list or library, under Title, Description and Navigation.